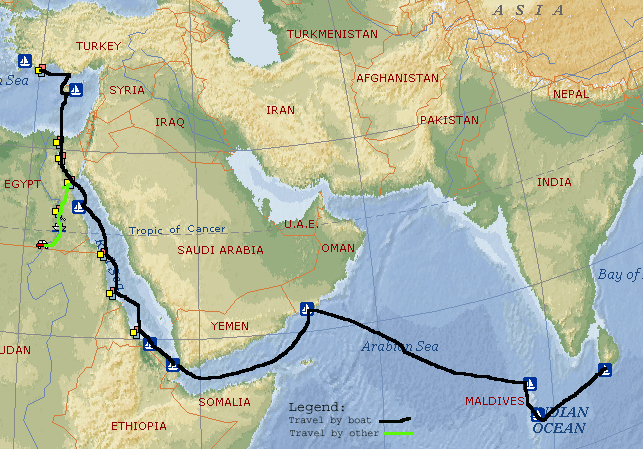 The beginning of the 2004 cruising season in the Mediterranean was also the beginning of the end of our Mediterranean cruising and the start of the transit to SE Asia. This trip would be a big change from the seasonal cruising we had become used to during eight years in the Middle Sea and it would present us with unforeseeable challenges. Challenges that if they could be foreseen may have altered our decision. While all cruising sailors cherish their independence and self reliance, in the Med one always knew, deep down, that in a real emergency help was a VHF radio call away. Once one heads south from the Suez Canal that security blanket becomes very thin. During several months and many thousands of miles that follow the departure from Port Suez help, if needed, would be virtually non-existent. While a mechanic can usually be found in most ports there will be long legs between any such ports. Even if a competent or even a semi-competent mechanic can be found, repair parts will be very hard to come by. Any mechanical breakdown that could not be repaired by on-board assets could be a disaster not to mention the devastation a health problem would cause a two person crew. Yet despite the risk, June saw the beginning of another great adventure.